A lone fisherman crosses a narrow footbridge as he returns home to a rural village nestled amongst trees at the foot of a high, thread-thin waterfall. Opaque, finger-like bands of mist, seemingly laden with the humidity of the passing summer rain, reach in from the left. They obscure the top of the waterfall and create a sharp division between the foreground and background of this monumental landscape composition. Soaring, rounded peaks, outlined by light ink tones and accentuated with repetitive short, horizontal strokes dominate the upper two-thirds of the painting surface. A faint ink wash applied in broad, flat areas indicate the distant mountains. Through the extensive use of soft, wet brushstrokes, carefully orchestrated in tones of black ink, the artist successfully conveys the refreshing atmosphere of a mountain scene after the rain. Less convincing, however, is the spatial arrangement: the various compositional planes are layered flatly, one above the other, resulting in the loss of a sense of spatial depth. Bunchō was one of the most significant and prolific painters in the city of Edo in the late eighteenth and the first half of nineteenth centuries and his oeuvre was characterised by an eclectic artistic approach, in which he combined a variety of styles, ranging from the indigenous Yamato-e tradition, to the Chinese academic style of the Northern school (‘hokushūga’), the idealist painting style of the Southern school (‘nanshūga’), and Western-style painting (‘yōfūga’). 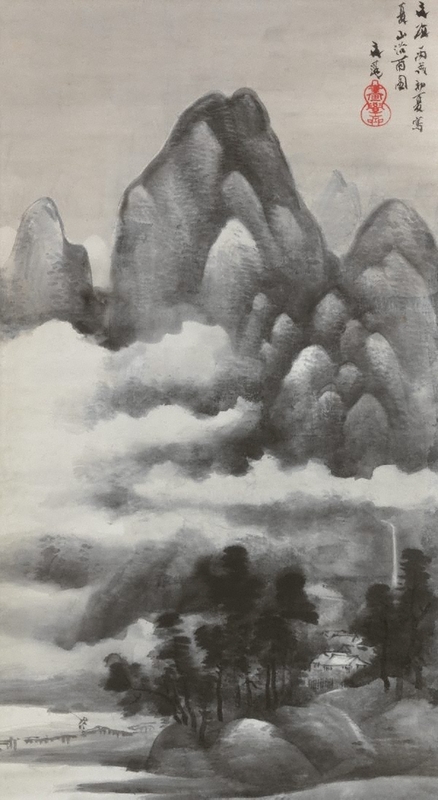 ‘Early summer mountains in the rain’ reflects this eclecticism, in which the composition of a majestic central peak presiding over simple, secluded dwellings emulates the tradition of the Chinese academic Northern-school painting style, while the soft, structuring horizontal strokes are reminiscent of the ‘moss dots’ characteristic of the style of Mi Fu (1051–1107) and his son Mi Youren (1075–1151), two of the most famous exponents of the Southern school. The work of Mi Fu and his son was hugely popular among Japanese literati painters of the Edo period. A great many documented landscape representations by Bunchō in the hanging-scroll, folding-screen and sliding-door formats, which use the same techniques and compositional mode as seen here, date to the Bunsei era (1818–30). Among them ‘Summer mountains in the rain’ is a major work (1). The inscription in the upper right corner provides the title of the composition and records that it was painted in the early summer of 1826. The date is followed by the artist’s signature and his gourd-shaped seal reading, ‘Gagakusai’. (1) This work was exhibited and published in Japan until 1987, when it entered the collection of the Art Gallery of New South Wales (see Tochigi Prefectural Art Museum [ed.] 1979, cat.no. 90, n.p.). The most comprehensive publication on Bunchō to date is Kōno (1987); this work is illustrated on page 57. Khanh Trinh, ‘Early summer mountains in the rain’ in James Bennett and Amy Reigle Newland (eds. ), ‘The golden journey: Japanese art from Australian collections’, Art Gallery of South Australia, 2009, p. 148.